Richard Pyrah has announced his retirement from all forms of county cricket with immediate effect. The 32-year-old, who is midway through a successful benefit year with Yorkshire, will take up a full-time post on the club’s coaching staff where he will work across all teams from age group cricket to the senior side. The Dewsbury born all-rounder made his limited-overs debut for Yorkshire in 2004 in a 34-run victory over Leicestershire at Grace Road. In all, he has made 118 appearances in List A matches scoring 1,084 runs. With the ball, he has taken 140 wickets at an average of 26.21. He was rewarded with his Yorkshire cap in 2010, when ge claimed 20 wickets in the 40-over competition and an impressive 21 wickets at 19.42 in the T20 campaign. He also contributed 304 first-class runs in seven matches. In 2011, he was Yorkshire’s leading T20 wicket-taker with another 21 victims, including 5-16 against Durham at Scarborough, which stood as the best analysis for any Yorkshire bowler in the 20-over format. 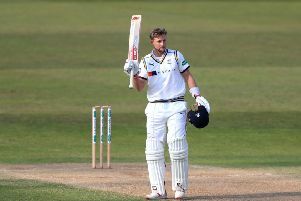 In first-class cricket, he has played 51 matches scoring over 1,600 runs with a top score of 134 not out against Loughborough University in 2010. Arguably, his most memorable innings came against Lancashire at Headingley in July 2011 when he rescued Yorkshire from 45-8 with a brilliant 117. Pryah wrote his name Yorkshire folklore when he took the catch to win Yorkshire’s first Championship in 13 years catching out James Taylor at Trent Bridge last September. He has also had spells in local club cricket for Cleckheaton and Woodlands in the Bradford League, along with home side Ossett in the Central Yorkshire League. Pyrah said: “I have had a wonderful career with Yorkshire and enjoyed every aspect of it. “I am now ready for the next chapter in my life and I have always had aspirations of going into coaching. I have successfully done my ECB Level Three and I am just about to embark on the Level Four qualification over the next two years. “I’m ready to offer my experience to every aspect of Yorkshire cricket – from developing the ever-increasing young talent that continues to flourish through age group cricket and working with the senior players. He is ready to become a successful coach and I am looking forward to working with him in the next period of his career.